Los Feliz — Many of the persons who walk or drive by the busy intersection of Rowena and Hyperion avenues might be surprised to learn that they are passing right by the Rowena Reservoir. Hidden behind dense greenery, berms and encircled by a tall green fence, the 10-million gallon reservoir is buried underground and topped by park-like grounds with decorative lagoons, waterfalls, palm trees and walking paths. Now, there’s an effort to open up the grounds that have been off limits to the public for more than two decades. 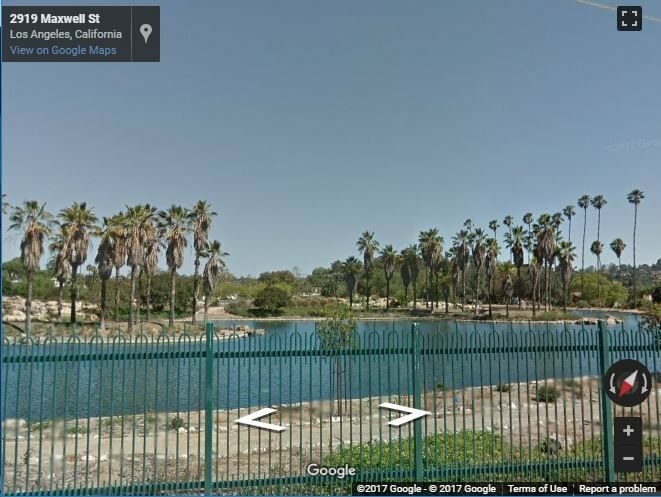 On Tuesday night, the Los Feliz Neighborhood Council is scheduled to review a resolution supporting the opening of the six-acre property to the public. That might not be easy, however, since the L.A. Department of Water & Power, which manages and controls the property, has long resisted efforts to do so. And, it turns out, many people who live near the reservoir also want it to remained closed. A recent survey of 230 residents who live within one mile of the reservoir showed that the 84% “support a lot” the idea of opening the property during daylight hours. However, that level of support dropped to 60% among those who lived within half mile of the reservoir. Meanwhile, 30% of those who lived nearby opposed the idea. The survey found that opening the reservoir grounds might reduce the times nearby residents have to drive to Griffith and more distant parks. However, others were worried that opening the reservoir grounds to the public would attract more traffic, trash and homeless. Even if the council votes in favor of opening the reservoir property, it lacks authority to do so. LADWP officials have long said that high-voltage electrical and other equipment related to the reservoir tank poses a hazard to those who wander nearby.